Please consider donating if you enjoyed the map! 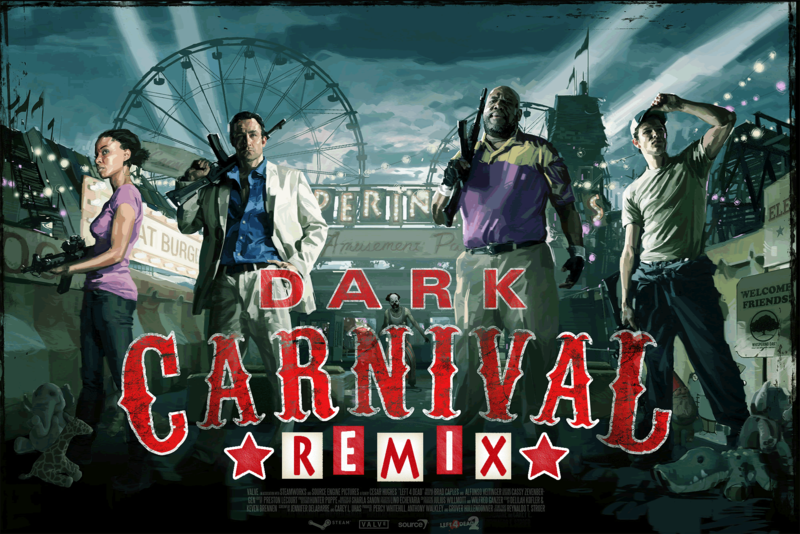 Valve developers Phil Co and Dario Casali for information on Dark Carnival's beta development. Daroot Leafstorm for scripting help. Eranthis for his custom billboard textures. SpeedBoost for his Ferris Wheel model. MrFunreal and Roku for technical assistance. Epilimic for providing a test server. Olde, Jacob, Sir, Roku for beta testing feedback. Dark Carnival: Remix is a remake of Dark Carnival that restores beta and cut content and adds new areas of Whispering Oaks for you to explore! See the Tunnel of Love with flowing water, the towering Ferris Wheel spinning around, and the explosive Concert finale as it was originally intended. In addition, new mechanics have been added for versus mode that provide for a more competitively balanced experience. There's also a secret ending cutscene that bridges the gap between Dark Carnival and Swamp Fever if you can find all five secret coins! The secret ending only works in Single Player for now. Special thanks to the original designers of Dark Carnival at Valve for providing me with information about its beta development. - Removed Common RNG: Ever wonder why it seems the other team got more common than you? Valve common spawning scripts during events contain RNG elements that can cause that. In addition, it would stop spawning or reduce common if you took too much damage. With new scripts, those mechanics are no more: events are now fair for each team. - Reduced invisible walls: You can now get practically anywhere you want in any map. - Raised skyboxes: Hunters can now pounce higher than ever before with greatly raised skyboxes. - Highly polished clipping: Never get stuck on random objects again. - Thoroughly Made Nav: "God" Spots where Witches and common are unable to attack should be rare to nonexistant. Mobs will never spawn on rooftops and drop down on your head, removing an annoyance and reducing the potential for the instakill bug. - More infected ladders: More strategies open as more areas are accessible. - Reduced Voice Spam: Some of the scripted conversations the Survivors have are removed in versus mode. A bit of Scavenge, a bit of Holdout, a bit of Gauntlet, but completely unique. This new finale type give Survivors distance points as they complete various objectives around the map. Survivors need to notify the chopper in the stadium finale by setting off fireworks, turning on spotlights, filling up generators, and ending in an explosive guitar solo! On Map 2, the water slide will gently push players down to the bottom. If you get incapped here, you'll drop into the pool and start drowning. Be careful where you get incapped! During the Midnight Riders finale, Survivors must activate the guitar solo lightshow by standing within a zone on the stage. At least one Survivor must remain in this zone at all times until it disappears. Q: What is this coin I've found in the map? Each map has a hidden coin easter egg to find! Each of them can be found up by Survivors, so you don't need to switch to infected to find them. If you find all 5, one in each map, you will unlock a secret ending that bridges the gap between Dark Carnival and Swamp Fever! Who can find them all first? Q: Why is it abbreviated DKR instead of DCR? It's been tradition in the L4D2 community to abbreviate Dead Center as "DC" and Dark Carnival as "DK" to differentiate them so I just continued the pattern. Q: Why does *insert object here* have no collision? It can be very annoying to be running back from a Tank or other special infected and get caught up on a random prop or piece of map geometry and have your movement halted. So I've meticulously examined every single part of every map and tried to improve the collision on everything. You should rarely, if ever, get stuck on small objects, if you do send me a message and I can fix it. Making some props have no collision hurts immersion a bit but I think the trade off is worth it. In the case of the roller coaster on map 3, most of the wood pieces have no collision to prevent many skips and exploits. Q: Why the name "Remix"? A: Remix has a similar meaning to the word "remake" which is what this campaign is. It also has relation to music, which fits with the Midnight Riders theme in the campaign. Q: I've found a bug/have a balance suggestion/found something that could be improved. Please message me on Steam (http://steamcommunity.com/id/mnf/) or post here. Q: Why does map 2 feel different? Map 2 contains designs that I created back in 2014 when I was much less experienced at mapping than I am now, so the tone feels a bit different. I might go back and completely remake the map from scratch at some point since I'm not happy with it. Q: What are the map names? - Added new unused voicelines and conversations. - Restored an interpretation of the original finale where Survivors must go around setting off fireworks, turning on lights, etc. - Restored an incomplete Fairgrounds tent model. - Restored the cut pool/game room (added to map 4). - Added the inaccessible storage room from c2m4_barns to map 3. - Added some unused models to various maps. - Restored the cut sequence of the copter being unable to land before the Tank is killed in the finale (coop mode only). Thanks. I'm going to go through and check every ladder in the game soon and fix all the broken ones I find. This is the version that will be used in the Really Big Tournament #4. Please update when you can. Sorry to put out another update so soon, but I was informed of a game breaking bug on the finale that required immediate fixing. I think the finale is also much more balanced and fun with this change as well (previously it was too hard and a wipefest). Also, to clear up some confusion: On map 3 of the coaster, when survivors drop down the double ramp drop, all fall damage is negated on the drop. This was necessary to prevent people from taking damage as they dropped down. Unfortunately, this also means that charges off will likely not be an instant incap as well. Just something to keep in mind. Removed the second finale Tank: There is now only one Tank on the finale. Reduced finale distance points to 600 to compensate. Fixed a broken infected ladder on map 4.